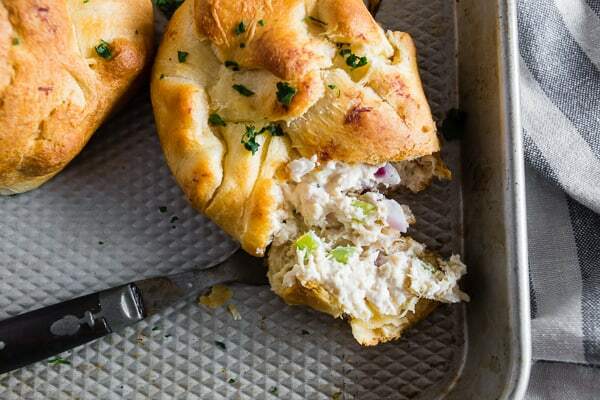 These chicken crescent packets are packed with shredded chicken, cream cheese, red onions, and celery. Super simple to make and ready in just 30 minutes! Trust me, you’ll love this quick and easy dinner recipe! 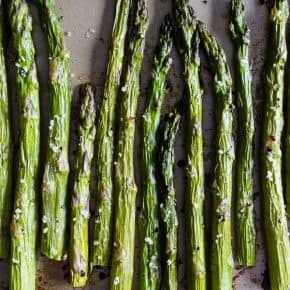 Ok, so this recipe is not super gourmet but I have LOVED it since I was a kid. 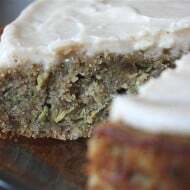 I actually shared this recipe back in 2013 but it needed a little update. They are so crazy easy to make and even work well if you want to prep them in the morning and bake when you get home. PLUS you’ll love that flakey buttery crescent paired with the creamy cream cheese chicken filling. If I’m going to take a shortcut in the kitchen this is one of those meals that I immediately gravitate towards. My mom used to make it when I would visit and I finally remembered to grab the recipe from her when I moved out on my own. Speaking of redos I’m currently redoing my entire house. I’m OBSESSED with pinning ideas and have currently bought about 3850850483 live plants to decorate my house. Ok, not really that many but I do probably own close to 20 plants. I’m all about the succulents, cacti and hanging pots. I also just placed an order for some hanging macrame planters that makes me wish I was alive in the 70’s to learn that skill. I mean, I guess I could learn to macrame now but I’m not really into starting another hobby. Mostly because my normal hobby is starting hobbies that I eventually quit. Anyway, back to my house. I’m going to put together a BIG post on all my changes since I’m using my whole summer to update. I’m going to paint the house, change the flooring, buy some new furniture and (of course) have my house filled with plants. Oh, um I guess I should talk a little more about these little chicken crescent packets. 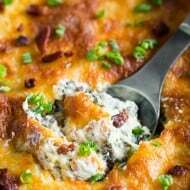 I like to add a little garlic, celery and red onion but it’s really customizable and you can add just about anything you love – dried cranberries, fresh herbs, cheese, etc. The real selling point is that the whole dish is ready in just 30 minutes! 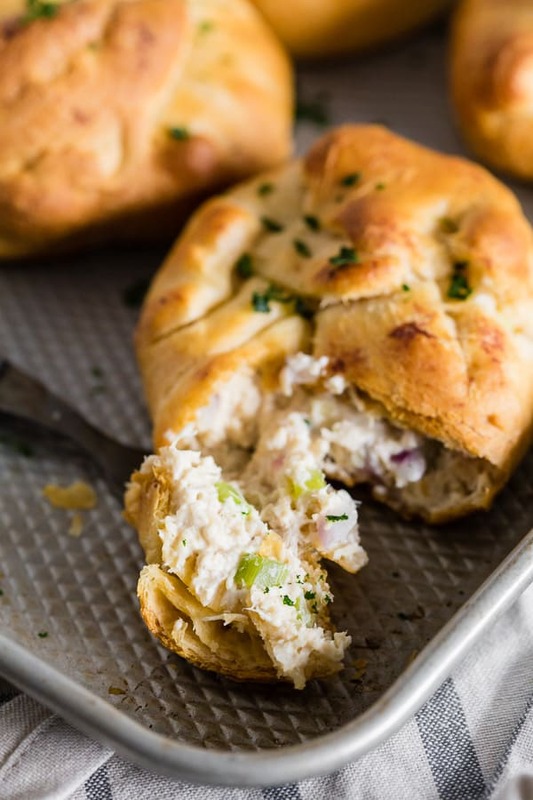 These chicken crescent packets are packed with shredded chicken, cream cheese, red onions, and celery. Super simple to make and ready in just 30 minutes! Trust me, you'll love this quick and easy dinner recipe! Preheat oven to 375 degrees and prepare a baking sheet with parchment paper or silpat. Open crescent rolls and press two rolls together at the seam. This will create 4 large crescent rolls. In a medium-sized mixing bowl add shredded chicken, garlic, cream cheese, red onion, and celery. Mix together until smooth and creamy. If the mixture seems overly thick add a splash of milk so the mixture is still thick but creamy. Add mixture to the middle of each large crescent roll and tuck the corners up over the mixture. Creating the little packet seen in the picture. If you get a little hole in your crescent roll simply pinch it back together. Bake for about 15-20 minutes or until the packets are browned and fully cooked on the outside. Note: This recipe doubles perfectly! I actually think the photo is quite delicious! These packets sound amazing! How can you go wrong with cream cheese and crescent rolls? Can you mail me these, please? YUM!!!! Lady, they look good to me! 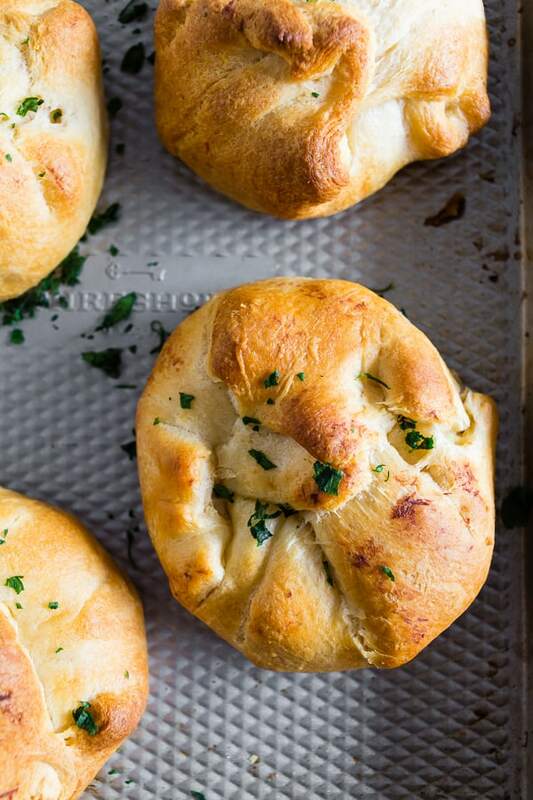 Love tasty, simple recipes like this (and our fam has a serious weakness for crescent rolls.) Done! I think the photo is great! I’ve made a similar dish and I loved it. They look scrumptious! 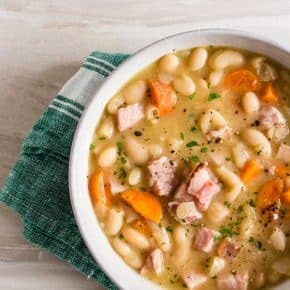 Perfect fall comfort food right here! Yum. Brown food is so hard to photograph! But since this recipe uses Pilsbury crescent dough, it has to be good! Yum! How is it that all the happy foods out there always are so beige? Lol. I’m sure those insides are awesome though. Sounds delish to me- I think we all have those foods that are so amazing but so hard to photograph. I think it turned out great though. 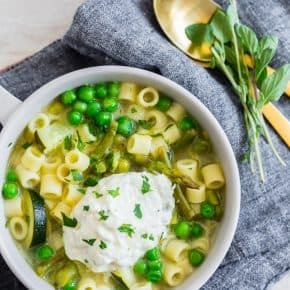 I am saving this one–looks easy and delish! My mom used to make a recipe almost exactly like this. I can see how they would be hard to photograph, but I know they taste good! Ok, I think the photo is just perfect! It does it justice, trust me, because I’m ready to jump right in and grab one! 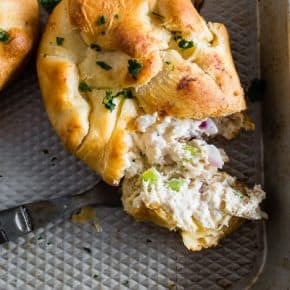 LOVE chicken pockets using crescent rolls. Mmmmm!!! 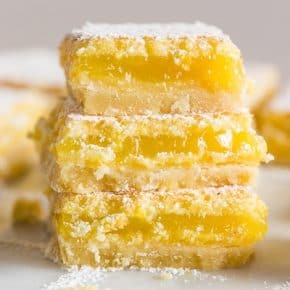 Photo is great and these look delicious! YUM! Is it weird I really want one of these for breakfast!? Cause I totally do. Top with seasoned bread crumbs moistened with melted butter. Makes it all the more flavorful. Hi Jody! I’m so glad you enjoyed the packets. They are a favorite around here! I have loved these since I was a little girl. My mom always made the for dinner. I purchased the GRANDS crescent rolls, used garlic and herb cream cheese tonight and put the seasoned breadcrumbs on top and they were fantastic. Even my somewhat picky 5 year old scarfed one down. I can’t wait to try other fillings inside. 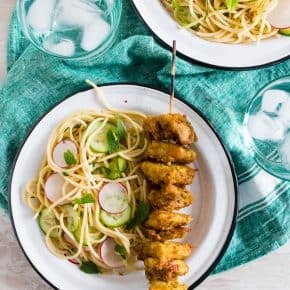 I can’t wait to make these next week for lunch. They are making my mouth water right now. What a great idea for dinner. I am always looking for something quick, tasty, and easy to place on the dinner table. 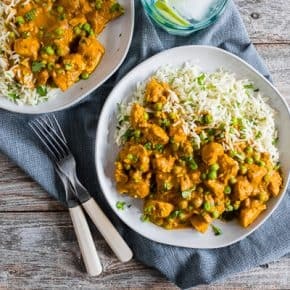 Love this for a quick and easy dinner! Yum! 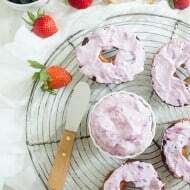 I’m totally in for crescents stuffed with pretty much anything but definitely when cream cheese is involved! These look amazing! Mmmm, those look so tasty! I am always looking for new and delish recipes for my family. I may make this one just for me!! I could dig into a whole pile of these right now! OMG it looks so good!! I wanna have it all!! I love this idea! It looks so delish! My mom also made something like this back in the 80s–she found the recipe and prepared it for her Gourmet Club lunch! It was called Chicken Picnic Pockets and the filling was sliced black olives and scallions with the chicken and cream cheese. Also a delicious combo, so thought I’d share. Thanks for the memories!